A bout between Anthony Johnson (7-2 MMA, 4-2 UFC) and fellow welterweight Yoshiyuki Yoshida (11-3 MMA, 2-1 UFC) will take place in October at UFC 104. A source close to the negotiations today told MMAjunkie.com (www.mmajunkie.com) verbal agreements are in place and bout agreements are in the process of being finalized. UFC 104, which features a main event between UFC light heavyweight champion Lyoto Machida and challenger Mauricio "Shogun" Rua, takes place Oct. 24 at the Staples Center in Los Angeles and airs on pay-per-view. Johnson, who's posted back-to-back knockout victories over Luigi Fioravanti and Kevin Burns in his two most recent fights, had been slated to fight hard-hitting Matt Brown at The Ultimate Fighter 9 Finale in June. 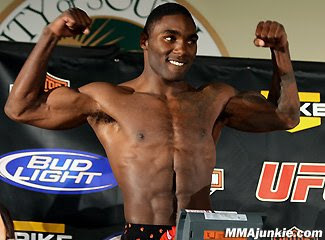 However, Johnson suffered a knee injury prior to the bout and was forced off the card. Upon his return, the former JUCO national wrestling champion (Lassen Community College) will go for his fourth win in five fights and his fifth consecutive win via knockout.